Finally, the working hours are over! You have hit your work target for the day, well done! However, you are feeling so much low that you don’t even feel like interacting with your playful furry friend when you get back home. Well, to stimulate your senses so that you feel somewhat human, all you need is a relaxing shower. Now, the type of showerhead you choose is all it takes to define your experience in the bathroom. In other words, if you need to make the most out of that time, you need to equip your bathroom with the right dual showerhead. Dual showerheads beat the regular single headed showerheads in that they deliver higher pressure and an improved water flow rate so that you spend less time in the bathroom. 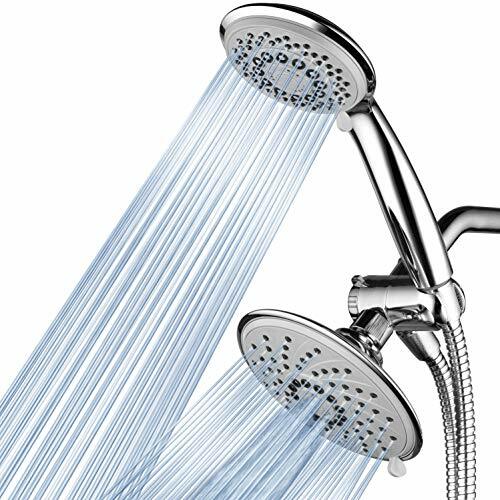 In this article, we have suggested the 10 top-rated dual showerheads for you. Our first suggestion goes to this commercial-grade dual showerhead. The dual showerhead comprises of one overhead shower and a handheld shower. Whether you need to enjoy the convenience of using the two showerheads or want to get the long relaxing shower of a single head, the two showerheads can be used together or separately depending on your preference. Different water flow patterns deliver diverse shower experiences. And yes, each of the head of this 2-in-1 unit delivers up to 24 water flow patterns. This feature allows you to customize your shower so that you get the best out of every bath. Both the overhead and the handheld shower also come with five settings. You can now choose the power rain mode, stay warm mist, pause, water-saving economy, and the power massage setting depending on what meets your needs best. To select a setting, you need to turn the knob on the right high or low until you achieve your desired mode. Therefore, you can even enjoy different settings on each. When buying a showerhead, the level of adjustability is fundamental since it defines how well the showerhead meets your personalized needs. Hydroluxe full chrome dual has an adjustable overhead bracket that allows you to tilt the showerheads to get the perfect height you want. The showerhead features a 5-foot hose that brings convenience in your bathroom. Furthermore, the tube is of stainless steel material that is not only durable but also resistant to rust even in constant exposure to water. The material is not heavy-duty. This unit consists of one oversized 7-inch chrome face and an extra-large 4-inch chrome face shower. The dual showerhead allows up to 30 shower patterns, that is, 18 combined settings and 12 full settings to meet your specific needs. Before you get into the shower, you should first ensure that the showerhead is clean. Although some shower heads may give you a hard time to clean, Aqua-dance dual showerhead feature rub-clean jets that make cleaning the piece a snap. This premium-grade showerhead allows you to choose between power rain, rain/mist, power mist, massage, pulsating massage, and the water saving pause mode. The two showerheads can run the same setting or different settings depending on how you want it. No one wants to spend hours installing a showerhead. Although most of the showerheads are easy to install, there are a few that may are a hassle. And yes, Aqua-dance showerhead installs easily without the need for tools. Never installed a showerhead before? No problem- the unit comes with clear instructions to avoid guesswork. Switching between settings is easy. It doesn’t offer maximum adjustability. Just in case you are looking for a showerhead that is durable, this should e a good option for you. The high-quality showerhead comes with superior stainless steel construction. The stainless steel material offers resistance to rust and elevates the elegance of any bathroom. The larger showerhead comes with a 7-inch chrome face while the face of the handheld shower is 4 inches. Apart from the two shower heads, the pack also comes with a shower hose so that you don’t incur other costs in completing the set. The super flexible tube is of stainless steel material that not only stands the test of time but also perfectly dovetails with the stainless steel heads. 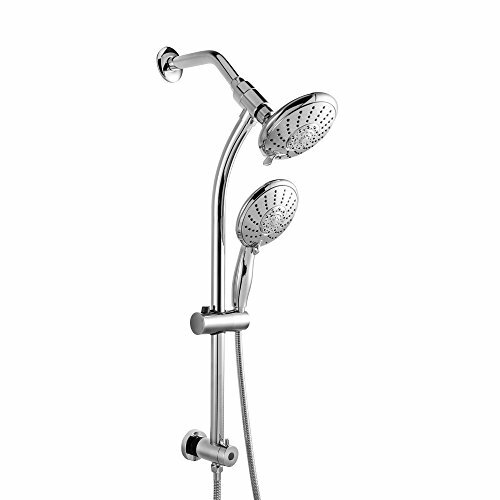 DreamSpa 1432 unit also comes with easily-adjustable settings that meet different shower needs. These settings include; pulsating massage, mist/rain, massage, eco-rain, power rain, hydro-mist, and water-saving pause. 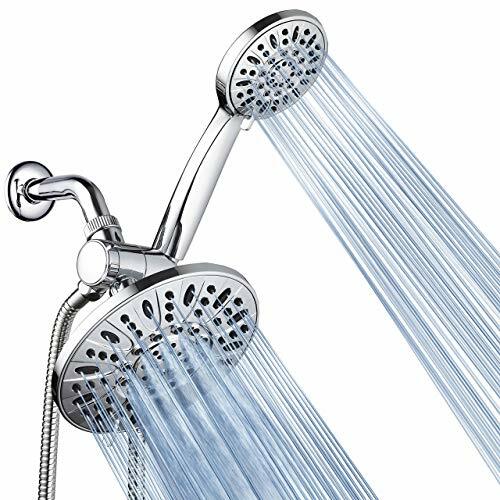 Whether you need to use the two showerheads simultaneously or just a single showerhead, this 2-in-1 shower head comes with a 3-way water diverter that allows you to disperse the water to either each or either of the showerhead. The easy-to-use water diverting knob is on the side of the diverter valve. It comes with an extra-long hose. It delivers excellent water pressure. The hose nuts are easy to hand-tighten. The showerhead may begin to leak after some time. Also being part of our suggestions, there are lots to like about this dual showerhead. For example, the construction is excellent and the 30 water flow patterns give you a shower experience like no other. The shower head measures 6 inches while the handheld unit features a 4-inch face. The two showerheads allow you to choose your ideal setting from the six full spray settings. The settings include power rain, pulsate massage, rain/massage, hydrating mist, and power rain. For efficiency, the dual showerhead also comes with water-saving economy rain as one of the settings. Before you buy any showerhead, it’s important to ascertain whether it will fit the shower arm. HotelSpa 30-Setting Ultra Luxury option goes with the standard overhead arm. This feature renders it as one of the most highly compatible showerheads the market holds. Sometimes assembly can turn arduous especially if it’s your first time. This explains why this showerhead comes with an easy-connect design that does not require screwdrivers, power drill, or even plumpers- it only needs your hands to get the work done in minutes. The pack arrives with easy-to-understand instructions so that you don’t miss the mark when installing. The adjustable overhead bracket lets you easily tilt the showerhead to your ideal angle. This feature also helps adjust the height of the unit. In other words, if you are looking for a showerhead that will suit different statures, you may consider giving this dual showerhead a shot. The size of the showerhead is excellent. The jets are easy to clean. It comes with installation instructions. The pause position on the handheld showerhead does not entirely stop the flow. One of the things that you will love about this showerhead is the sleek design. This design pairs with the traditional style to make the unit a perfect addition to any bathroom. To save your energy bills, the comes with a water-saving shower technology making it an ideal option for those in the lookout for a budget-friendly model. The showerhead goes with the standard-size shower arm for broader compatibility. All the parts of this showerhead are electroplated with a beautiful brushed nickel finish that adds unique accents of beauty to your bathroom. However, just in case this is not the perfect finish for your bathroom, the showerhead is also available in chrome and oil-rubbed bronze finishes. Each of the showerheads comes with a 5-inch face. The wider size provides a rainfall spa experience that will help you relax. With such an experience, you will always want to stay in the shower and not come out. Although most people do not consider this factor when choosing a dual showerhead, it remains critical. And yes, when it comes to ergonomics, Ana Bath Anti-Clog showerhead consists of a handheld shower that comfortably rests in your hand. The unit also boasts a transitional design that will perfectly blend into your bathroom style. The hose of this model is of premium-quality metal that provides better durability. The tube measures 5 feet in length and is ultra flexible for maximum convenience. But just in case this length is not big enough for your needs, a longer hose is available. Furthermore, the brass ball joint is also guaranteed to last for years. The five functions provide different shower experiences. The handle and the showerheads are not of metal although they are of high-quality plastic material. Whether you want to enjoy the high-pressure of a single showerhead or the convenience of the dual mode, this unit features a Spiralflo design that allows you to use both the showerheads simultaneously or separately. The handheld showerheads measure 4 inches each to deliver extensive body coverage. This showerhead gives 30 combined water flow patterns for different water patterns. Furthermore, the five functions allow you to choose between the different settings. The settings in this model include; power rain, pulsating massage, power mist, rain massage, rain mist. The water-saving pause setting mode stops water discharge when soaping to help minimize water wastage. The overhead bracket of this dual showerhead adjusts with ease to let you point each showerhead angles. The HotelSpa High-Pressure 6-Setting Dual Showerhead also has a customizable height which makes it a perfect addition to the master bathroom, children bathroom, and guests bathroom. The showerheads, hose, 3-way water diverter and the brass connection nuts are all of the top-grade materials that will last for years. The jets of the showerhead are easy to clean which helps to prevent lime build-up hence enhancing the durability. Hand-tighten connections eliminate the need for installation tools. The unit allows for adjustments. Some parts are of plastic material. 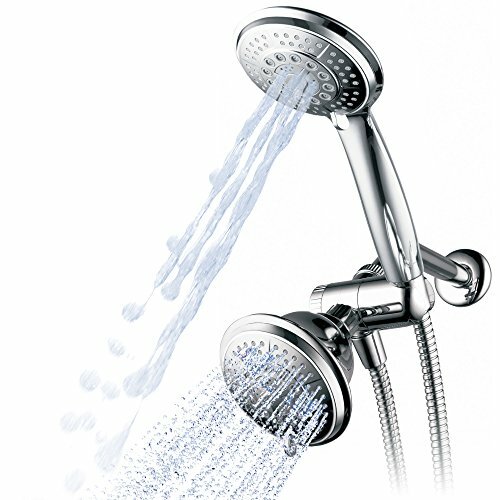 If you are looking for something unique for your bathroom, this dual showerhead should be a good option for you. Unlike the conventional dual showerheads that come with a rounded shape, this unit comes with a cool 9-inch square-shaped overhead shower and a square-oval handheld shower that guarantees to add uniqueness to your bathroom. The square overhead shower of this unit measures 9-inches in length. The extra-large length design provides shoulder-to-shoulder water flow coverage that helps to save time. In other words, if you often find yourself in a rush in the morning, this showerhead should be an excellent addition to your bathroom since it will spare a couple of minutes. The handheld shower also measures 4.75 inches, which is wider enough to deliver broader water coverage. The handheld showerhead features a convenient push-button which makes switching between different shower settings a breeze. In fact, since the push-button is conveniently located, you can customize the settings with the same hand you are holding the shower. This dual shower head is designed to connect effortlessly in any standard-size shower arm. In fact, leave alone calling the plumber, you won’t even need a screwdriver to get the work done; only takes is your hands and a few minutes if not seconds! It comes with an ergonomic design. It is super-easy to use. The jets clean with ease. You may have to buy a 3-way diverter separately if you need to run the two showers simultaneously. 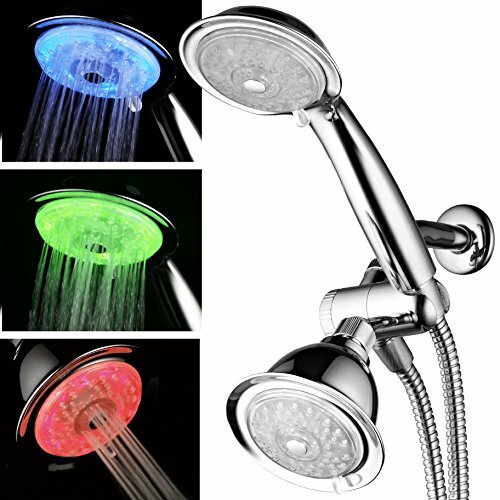 What makes this dual showerhead a unique option is the stylish design, The showerhead comes with vibrant LED lights that light up your showering experience. The LEDs are programmed to automatically change in every few seconds so that you don’t have to change the color manually. The water diverter means that you can use the two color changing showerheads together or individually. Usually, when using two showerheads simultaneously, the pressure is lower than when using a single showerhead at a time. However, this model employs the air-jet design which delivers a higher pressure than most of the dual showerheads on the market. The premium-quality 5-feet super flexible stainless steel hose features sturdy solid brass conical nuts. These nuts allow for easy hand tightening without the need for special tools. 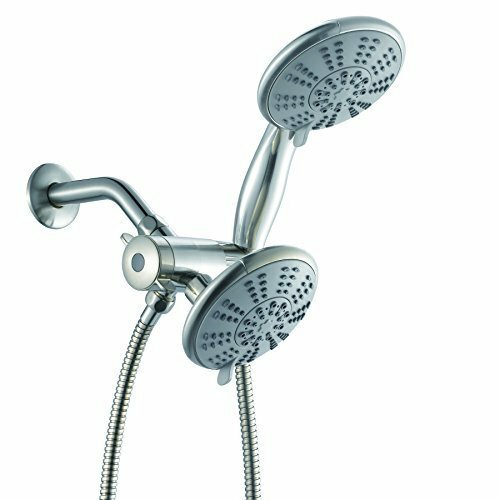 One of the features you will notice about this dual showerhead is that it comes with an extra-large top shower. The large size maximizes the water flow coverage which helps to save some minutes so that you arrive to work on time. The two showerheads of this unit are adjustable. This means that you can tilt the angle of the two showerheads easily until you get that ideal angle you need. The unit comes with an ergonomic design. It provides 24 water-flow patterns. The showerhead may start to leak after a while. This outstanding dual showerhead comes with user-friendly design for more user convenience. The top shower connects directly to the water supply hose while the ergonomic handheld shower slides easily to permit height adjustment to take the convenience a notch higher. The parts of this shower come with an electroplated finish which not only grants elegance to the bathroom addition but also cleans with ease to rid you of the cleaning hassle. The thermoplastic rubber materials (TPR) materials on the other side minimize the risk of clogging on the showerhead to make maintenance hassle-free. 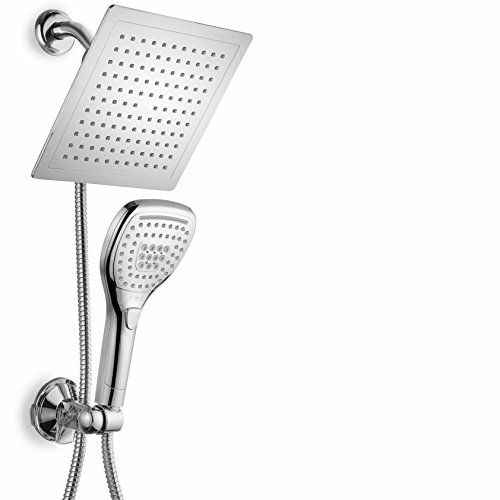 LORDEAR Commercial Flexible Dual Showerhead features five shower settings. These settings help to meet different user shower needs to ensure an excellent shower experience. The easy-to-use design means that switching between the settings is a snap. Apart from the adjustable handheld shower, this dual showerhead features low-positioned switch handle. This feature makes it a perfect showerhead for almost everyone without compromising on user comfort. Don’t want to destroy the walls of your bathroom? No problem! The body pipe of this shower head is engineered to be attached through the suction pad onto the wall. Therefore, you will not need to drill holes. This feature means that you can also uninstall the unit in no time when it turns necessary. The showerhead comes with a beautiful finish. The ergonomic design optimizes user experience. The top showerhead is broad. It doesn’t deliver the best pressure. This dual showerhead would be a good option for anyone who wants a durable choice. The premium-grade model comes with solid brass construction that can resist rust for years to come. Furthermore, the handheld showerhead slides into three positions to meet different stature needs. All the parts of this shower head system feature an oil rub bronze finish. The unique finish extends the durability of the bathroom appliance without compromising on beauty. The beautiful finish also pairs nicely with almost any bathroom decor. Both the top shower and the handheld shower can be adjusted depending on the needs of the user. The two shower heads allow you to customize to three heights making it a good bathroom addition for any family. The overhead shower easily mounts onto the wall while the handheld piece is lightweight for an easy time in the bathroom. The pack also contains a durable stainless steel hose. The hose is highly flexible for heightened user convenience. Furthermore, the stainless steel material smoothly goes with any bathroom decor for a more integrated look. This dual shower head is durable. The showerheads are not of a metal material but plastic. How often should you clean your showerhead? Most experts recommend a thorough cleaning of showerheads after a month. However, you can still clean it weekly to help avoid buildup. Why does your shower have low pressure? The cause of low pressure could probably be originating from the pipes. Pipes clog with time affecting the flow of water. You should also check to see if the pipe is leaking since leaks also reduce the pressure. Most shower heads on the market come with standardized size that goes with most shower arms. 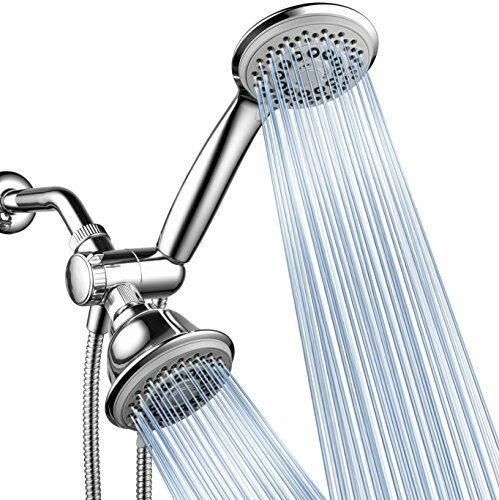 Do bigger showerheads use more pressure? Although the bigger showerheads use more gallons of water per minute, they reduce the amount of time you spend in the shower. Therefore, the amount you end up using per minute is nearly the same as when using a smaller shower head. Here, consider the quality of the shower heads, hose, and the water-diverter. Most dual showerheads come with stainless steel hose while the showerheads feature a plastic construction. However, plastic material should not worry you since it can be durable provided it is high-quality plastic. For increased convenience, ensure that both the main shower and the handheld shower allow for height and angle adjustments. The sizes of showerheads differ with the model. A larger showerhead is highly recommended since it provides a larger water flow coverage than the smaller sizes, allowing you to take less time in the bathroom. 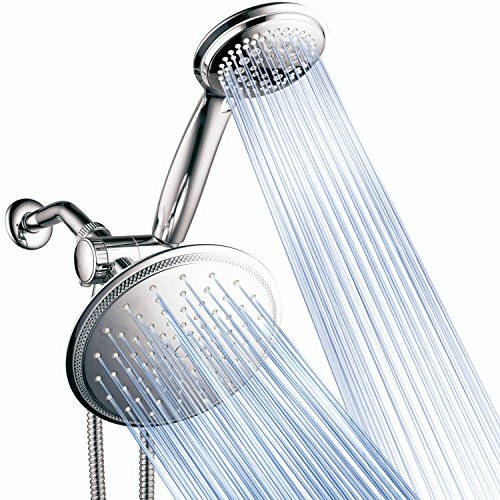 The dual showerhead delivers several advantages over the single-headed showerhead. When choosing the right dual showerhead for your bathroom, pay attention to the features, the settings, the quality of the parts, adjustability, and ergonomics. Most of the top-rated models discussed in this context come with all these features. However, I would personally choose LORDEAR Commercial Flexible Dual Showerhead because of the construction and aesthetics.